Cameron Lee, What Love Does and Why It Matters: Romance, Relationships, and 1 Corinthians 13 (Fuller Institute for Relationship Education, 2017). Paul’s “love chapter” is often misunderstood. In this book, I argue that we need to be more aware of the “culture of romance” that shapes how we understand the meaning of love — the better to appreciate what Paul is trying to teach the church. There are questions for individual reflection and group discussion at the end of each chapter. This is the second book to be published under the auspices of the institute; if you read it and find it helpful, I would greatly appreciate a positive review on Amazon or Facebook! Cameron Lee, Marriage PATH: Peacemaking at Home for Christian Couples (Fuller Institute for Relationship Education, 2015). This book builds on my earlier work in Jesus’ Beatitudes (see Unexpected Blessing, below), offering a biblical vision of peacemaking applied to marriage. Topics include the meaning and relevance of such virtues as humility, hope, and compassion for our relationships, including chapters on empathy and forgiveness. There are questions for reflection and group discussion at the end of each chapter. Cameron Lee and James Furrow, Preparing Couples for Love and Marriage: A Pastor’s Resource (Abingdon Press, 2013). Jim and I have put together a reproducible resource that pastors (and others) can use to begin a ministry of premarital preparation. Chapters teach pastors how to help couples manage potentially revealing conversations about their expectations regarding such topics as money and raising kids. Cameron Lee and Kurt Fredrickson, That Their Work Will Be a Joy: Understanding and Coping with the Challenges of Ministry (Cascade Books, 2012). Kurt is the director of the D. Min. program at Fuller–and we went to high school together. The book reflects a shared passion to help pastors deal with the stress of ministry. We’ve written the book not only for pastors, but for church leaders and seminarians, and have included a collection of letters to the reader written by some of our friends in ministry. Cameron Lee, Unexpected Blessing: Living the Countercultural Reality of the Beatitudes (InterVarsity Press, 2004, out of print; available as a free pdf download here). This one was my favorite to write. It’s an examination of the Beatitudes, those odd statements of blessing at the beginning of the Jesus’ Sermon on the Mount–and how what Jesus teaches there challenges our cherished cultural values. A guide for group study is included at the end. Cameron Lee, Beyond Family Values: A Call to Christian Virtue (InterVarsity Press, 1998, out of print; available as a free pdf download here). I wrote this in response to the “family values” language that was swirling in public debate in those days. Examining the question of whether the American family was in decline, I argued for Christians to recognize the ways in which we had already internalized the values of our culture, and thus needed to go deeper, recapturing the virtues of faith, hope, and love. 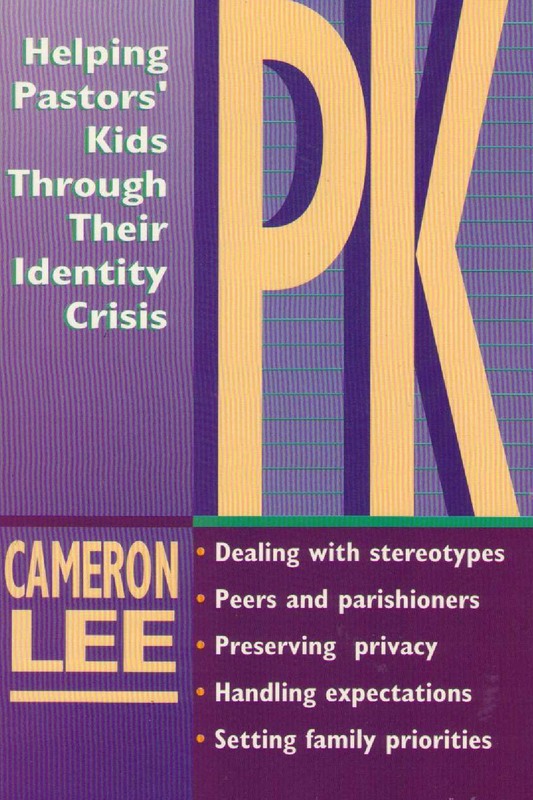 Cameron Lee, PK: Helping Pastors’ Kids through Their Identity Crisis (Zondervan, 1992, out of print; available as a free pdf download here). Twenty years ago, there was virtually nothing written about PKs. Frankly, I don’t think the situation’s changed much. That’s a pity–because to the extent that disgruntled PKs walk away from ministry, the church loses their potential leadership. This book was written to replace some of the stereotypes with reality, using quotes from PKs who graciously allowed me to interview them. Cameron Lee and Jack Balswick, Life in a Glass House: The Minister’s Family in its Unique Social Context (Zondervan, 1989, out of print). My first book was–yes–based on my dissertation. I caught the passion for studying and writing about ministry families from two of my mentors, Jack Balswick and the late Dennis Guernsey, and this book was the result. In it, Jack and I try to help readers understand how important it is to manage the social boundaries between the public life of congregational ministry and the private life of what happens in the minister’s home.